Stylish FPS Desync is coming along just fine, if the new trailer embedded above is any indication. The tough, twitch-oriented shooter is due to release at some point this year through Adult Swim Games, but if you're keen to play it sooner, you'll need to get to PAX East later this month. 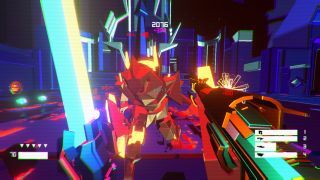 I played it at PAX Australia last year and came away interested: its focus on precision and quick thinking reminded me of a meeting between Hotline Miami and Lovely Planet, but there's a lot more to Desync than just shooting things. Well actually, shooting things is pretty much what you do, but the systems powering that shooting are interesting. "In Desync, defeating enemies increases your base speed / dash recovery with attack rush," reads a recent dev diary. "Enemies can be staggered, launched, shunted, overkilled and desynced. Desync isn't just about surviving though, at it's heart it's a score-based shooter." PAX East takes place April 22-24.